Welcome back. I hope everybody had a great Christmas. 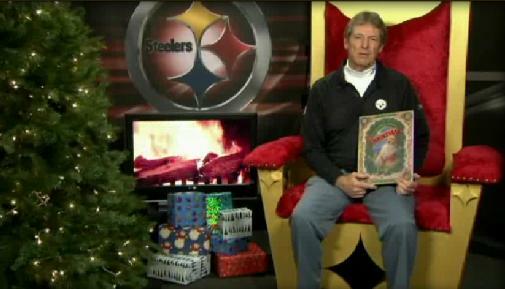 If you’re anything like me, I’m sure it included at least one piece of Pittsburgh Steelers related swag. At this point, I think I have more Black and Gold related dvds than NFL Films. I have no idea how this NFL season is going to end. What I do know is it’ll probably be in the least likely way possible. In a year full of twists and turns, the latest came Sunday when the Pittsburgh Steelers defeated the Cleveland Browns 27-11 to officially move into contention for the AFC Playoffs. 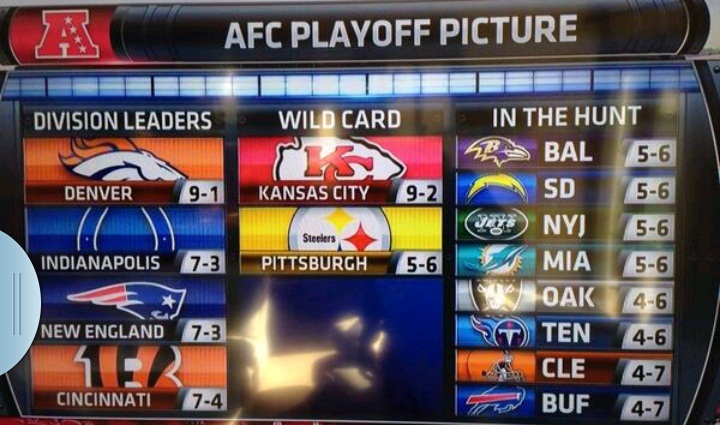 The graphic above showing the Black and Gold as the second AFC Wild Card team was valid for about three hours yesterday afternoon. That is, until Tennessee beat Oakland to move ahead of us by virtue of a head-to-head victory earlier in the season. Still, the fact the same team that started out 0-4 and got epically blown out by the Patriots a month back is even in the playoff race is utterly insane. C’mon, you knew I was gonna use that video at least once. This Sunday, the latest chapter in one of the most storied rivalries in NFL history takes place in Cleveland as the Cleveland Browns host the resurgent Pittsburgh Steelers. I’ve been loathe to use the p-word in association with the Steelers but in all honesty, the AFC is a complete disaster. Only the Broncos and Chiefs have broken away from the pack and would anybody be shocked if either or both were one and done in the playoffs? The rest of the conference is comprised of teams that have their strengths but also have some fatal flaws. The Browns and Steelers are not as far apart as Steeler Nation would like to think. I’ve been hearing a lot of confident talk from Steeler fans acting like this week’s game is chalk. First of all, even when the Steelers were good and the Browns were abjectly terrible the games were tight. Rivalry games tend to have the affect of evening out talent levels.